A graduate of both London and Reading Universities, I’ve been teaching in the independent sector for 20 years in the UK and Thailand. 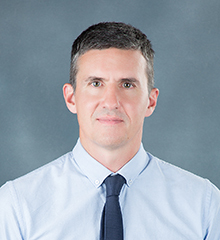 I moved to Bangkok in 2005 with my young family, working as Head of PE and Director of Studies at an international school before moving to St Andrews International School Bangkok, which I first saw as a visiting coach and loved the moment I saw it. The PE Department has grown immeasurably over the last few years and it has been a real pleasure leading it. My family and I enjoy being part of the St. Andrews community, which is vibrant and welcoming. We now have friends from all over the world and consider Bangkok our home from home. I play in a rock band here called Superhans with some of the other teachers at St. Andrews. It challenges me to learn a whole new skill set and as a result I value this in the children who I teach. St. Andrews is a welcoming, caring place. The children seem to enjoy learning and there is lots of interaction between the year groups. The fact that alumni students are so happy to come back and visit says a lot about the great experiences they’ve had at the school. "Mr. Ollie challenges us to be our best so we never knew what we were capable of." "Mr. Ollie keeps me motivated." "Mr. Ollie trusts his students and trains us hard."